FELINE GREENIES™ SMARTBITES™ Hairball Control Treats Chicken Flavor is rated 4.8 out of 5 by 33. FELINE GREENIES™ SMARTBITES™ Hairball Control Cat Treats are formulated to meet the nutritional levels established by the AAFCO Cat Food Nutrient Profiles for adult maintenance. Only for cat use. FELINE GREENIES™ SMARTBITES™ Hairball Control Cat Treats are formulated for cats 1 year old or older. For a healthy hairball benefit, feed 12 treats all at once daily. As with any treat, adjust the amount of your cat's main meal to compensate for the calories delivered by these treats. Always monitor your pet while feeding a treat. Provide fresh drinking water at all times. See your veterinarian regularly. To help maintain freshness, we recommend sealingthe bag tightly and storing it in a cool, dry location. WARNING: Use only as directed. If signs of hairballs persist, consult a veterinarian. Do not administer to cats less than 1 year old. Keep out of reach of children and pets. Hairball symptoms could include gagging or vomiting. Rated 5 out of 5 by jillio from these treats work!!!! my cat was trying to hoch up hairballs daily for two weeks. I thought i may have to take him to the vet. I tried these as a last resort. after two days of him eating these treats he has not had one episode it has been four days since i got them and there was an improvement immediately. thank you. Rated 5 out of 5 by HeatherW from Feline Greenies are a A Winner in My House! Both of my cats have been on a grain-free, gluten-free diet for years due to gastrointestinal concerns, and they have both had issues with hairballs lately. I decided to try the Feline Greenies SMARTBITES after seeing them in my local pet supply store, and it was one of the best decisions I've made for my cats. Neither has had issues with hairballs since starting these treats. They're also apparently pretty tasty since my cats follow me around the house meowing after they hear me open the bag. In the past, they couldn't have cared less about the other treats I've given them, so these will definitely be a staple in my house! Rated 5 out of 5 by Bridget from FINALLY A treat they'll eat! My cats, Tuxedo and Toes, are very fussy about the treats they'll eat. I've tried almost everything. The only treat they liked before now was the occasional small can of wet food. I got a small bag of chicken flavored Greenies Smartbites Hairball Control at our local pet shop. The cats LOVE them! They come running the instant they hear that pouch of treats be shaken. Thank you! 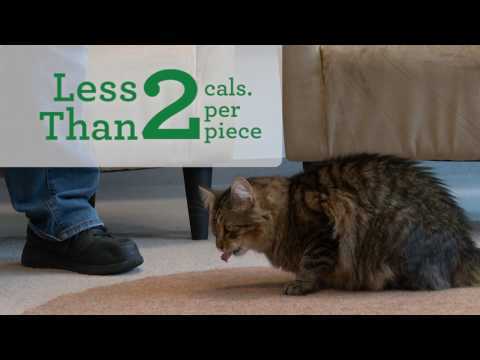 Rated 5 out of 5 by Cindy from Zoe's Favorite My cat, Zoe, loves Greenies SmartBites. She sits in the front of the pantry waiting for her treats every day. She waits patiently for a period of time, but she lets her humans know if we don't respond quickly enough. Her skin & coat are shiny, and teeth are great! Rated 5 out of 5 by pinkvintagelove from Our two cats love these! I have purchased these in tuna and chicken flavor, and both of our cats gobble them up every day! One is a long haired cat who often gets hairballs, and ever since giving her these daily it has reduced the hairballs immensely and her coat is soft and shinier. Rated 5 out of 5 by Catwoman99 from GREENIES HAIRBALL TREATS My cat loves these. He has a bad time with constipation and I was giving him pumpkin but had to syringe it to him every other day, which was stressful for both of us. He is not big on treats, but I thought I would give it a try. HE LOVED THEM!! I can't wait to see if they help. I hope it helps him go regularly so I don't have to go back to the pumpkin. Rated 5 out of 5 by Jojo from Love the hairball control! My long haired cat used to get hair balls frequently and now I give him the greenies hairball treats everyday and he hasn't had one since. Thank you greenies!